Starting in the spring of 2014, Telemetry Solutions worked closely with a National Geographic team. 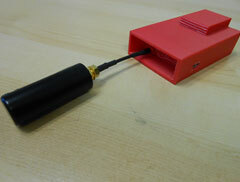 We designed and manufactured GPS devices for tracking elephant tusks. These artificial tusks were planted in the southeastern Central African Republic. They went directly into the illegal ivory supply chain. Consequently, the elephant tusks were tracked a total distance of 592 miles. This exposed the illegal global ivory trade. Furthermore, it demonstrated how the illegal ivory trade finances terrorist organizations. Tracking the artificial tusks was done in real time, we could see their daily movement. First of all, National Geographic investigative journalist and Explorer of the Year Bryan Christy contacted Telemetry Solutions. He asked if we could design and manufacture GPS trackers for this project. He might have found it a far-fetched, incredible thing to ask but it was right in our wheelhouse. Our immediate answer was, “Yes, we can do this.” This is a perfect example of using our various telemetry platforms to satisfy a custom application quickly. “To follow my artificial tusks from the jungle to their final destination, I need a tracking device capable of transmitting exact locations without dead zones. It needs to be durable and small enough to fit inside the cavities George Dante would make in the blocks of resin and lead that formed the tusks. Quintin Kermeen, 51, based in Concord, California, has the credentials, and the personality, I’m looking for. Kermeen started in the radio-tracking business when he was 15 and has since built electronic trackers and collars for wildlife from Andean bears to California condors to Tasmanian devils. He designed a GPS tracker that the U.S. Geological Survey embedded in live Burmese pythons to monitor the invasive snakes in the Florida Everglades. For his Judas pig project, he built GPS satellite collars to enable pest control authorities in New Zealand to send feral pigs into the bush and locate their invasive piggy friends. We meet over Skype. Since they had to be small, the custom-made trackers were 180 mm. x 53 mm x 29 mm. They weighed 97 grams. Most noteworthy, each was configured with a minimum 1-year battery life. Each device allowed the customer to set the GPS schedule. They also set the data transmission schedule based on their needs. These schedules were set using a web-based interface. Then they were transmitted by satellite to the artificial tusks. Schedules were routinely changed by the client while the tusks were deployed. Contact us if you have a funded project like this. Follow Telemetry Solutions on Facebook, Instagram, and YouTube!